In Europe, stock trading was mixed on Monday as the FTSE 100 traded lower while the FTSE 250 was higher. 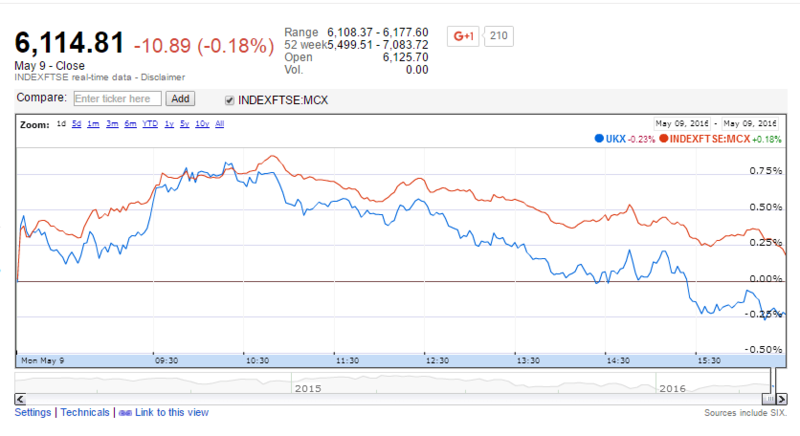 For the day the FTSE 100 closed at 6,114.81 for a loss of -10.89 points or -0.18 percent. The FTSE 250 closed at 16,687.06 for a gain of 38.30 points or 0.23 percent. Stock losses for the day were mainly led by mining stocks which fell as oil prices were lower and manufacturing data from China caused a change in the supply and demand outlook for the sector. Pharmaceutical stocks were higher for the day and specifically AstraZeneca which gained 72.98 points for a gain of 1.92 percent to close at 3,871.48, after several analysts upgraded the outlook for the company’s sales and earnings. G4S Plc was also actively traded Monday with a significant gain. The technology security company provided an update on its first three months of 2016, reporting the quarter showed a 4.5 percent increase in revenue in comparison to 2015 while booked sales were also higher leading to improved expectations for the remainder of the year. The stock was one of the leaders in the FTSE 250 for the day reporting a gain of 6.40 percent. Data from IFA magazine, reported the following stocks leading gains in the U.K. on Monday. In other European markets, France’s CAC 40 closed at 4,322.81 for a gain of 21.57 points or 0.50 percent. Germany’s DAX closed at 9,980.49 for a gain of 110.54 points or 1.12 percent. In Asia, China’s Shanghai Composite closed at 2,832.11 for a loss of -81.14 points or -2.79 percent. Hong Kong’s Hang Seng closed at 20,156.81 for a gain of 46.94 points or 0.23 percent. The S & P BSE Sensex closed at 25,688.86 for a gain of 460.36 points or 1.82 percent. In Japan the Nikkei closed at 16,216.03 for a gain of 109.31 points or 0.68 percent. U.S. market indexes traded basically flat on Monday. The Dow Jones Industrial Average closed lower at 17,705.91 for a loss of -34.72 points or -0.20 percent. The S&P 500 was higher, closing at 2,058.69 for a gain of 1.55 points or 0.08 percent. The Nasdaq Composite traded higher closing at 4,750.21 for a gain of 14.05 points or 0.30 percent.